The Armatic platform is designed to streamline and automate many time consuming manual tasks. 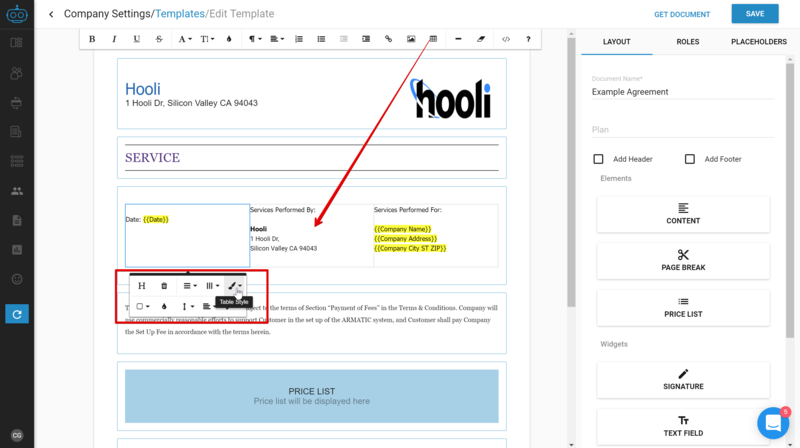 Templates are the basis of Quotes, Documents and can be use for common emails. you can send for e-signature as well as email templates. This guide will help you understand how to use the template editors different settings/options as well as how to get started. Template settings are located under Settings > Templates. From here, you will see a list of your current templates. Click the "action" menu to the right of a template to edit it or select "New Template" in the upper right to create a new one. The template editor is located on the right side of the screen and contains three menus, "Layout", "Roles" and "Placeholders". The "Layout" menu, allows you to control the general look and feel of the template. The "Plan" section is optional. 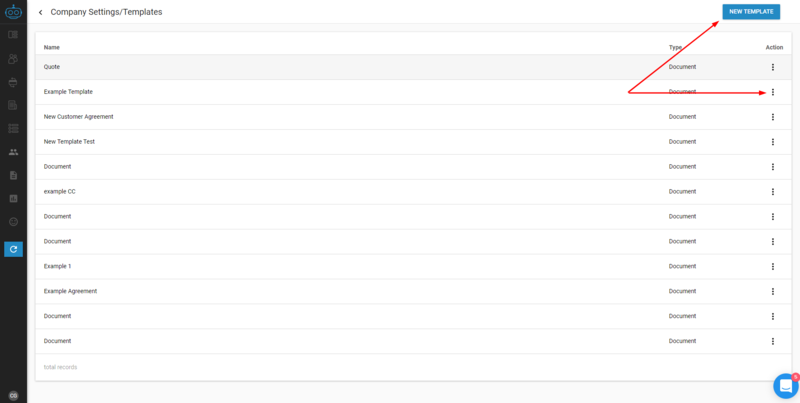 Clicking into this section will pull up a list of your "Plans" (located under Settings > Plans), and link it to this template. The purpose of linking a plan with a template would be to require specific language for selected plans (i.e. link an annual contracts to your annual subscription plan). This can be especially useful for limiting what sales users can edit. Similar to a word document, adding a header or footer will add the entered content to the top or bottom of every "Printed" page. When viewing a document online, the header/footer are only displayed at the very beginning/end of the document. Elements are the basis of your template, they are designed to be dragged and dropped into the desired location on the template. There are three types of elements, "Content", "Page Break", and "Price List". A Content element will be the most used element. All text, "Widgets" (Signature, Text Fields & Date Fields) images, Placeholders, etc. must be inside a content element. A page break will start a new page when printed, Page breaks do not affect the document when viewing it online. Price lists behave slightly different depending on how the template is used. 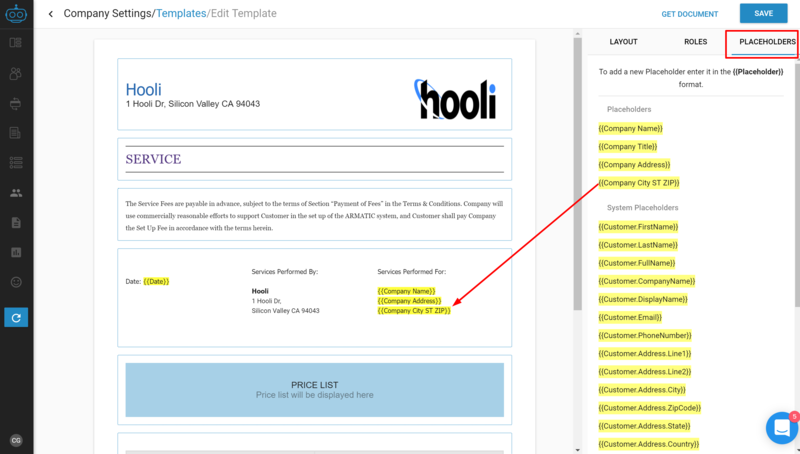 If the template is being used for a "Quote", the price list will be the location of a pricing table, populated based on the Line Items entered during the quote building process. 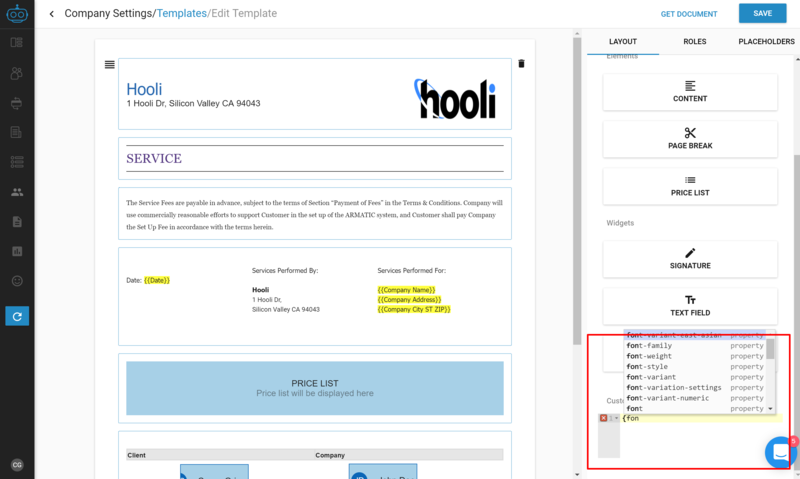 If the template is being used as a "Document", it will be a pricing table template that will need to be filled in manually. 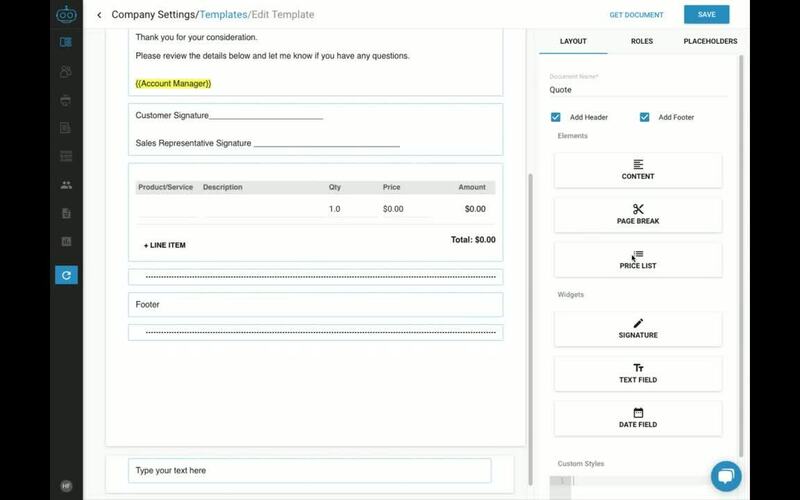 Widgets are fields of information that will be collected by recipients (Roles) of Quotes or Documents at the time of signature. A widget, must be assigned to a "Role" before the document can be sent and can either be "required" to be completed or not. A widget can also have a "placeholder" which serves as a label for the information the recipient should enter (i.e. 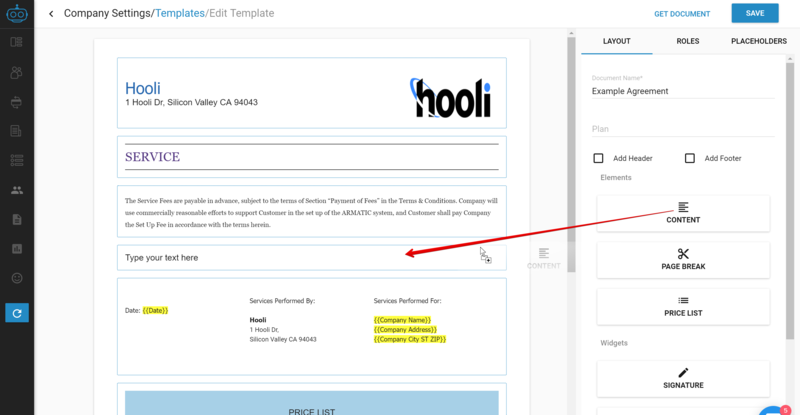 First Name).Drag and drop widgets into "Content" elements in the desired location on the document. A recipient will have the option to draw, type or upload their signature. A Date Field will open a date picker for the recipient to select a date. Roles are placeholders for recipients, assign a "Role" to a "Widget" to have that recipients be responsible for completing that widget. Select the require to enter billing info checkbox to require the recipient to enter a payment method (credit card or ACH) before the document can be completed. **Is it possible for a customer to complete a quote without entering in billing info, even when billing info was checked as required? 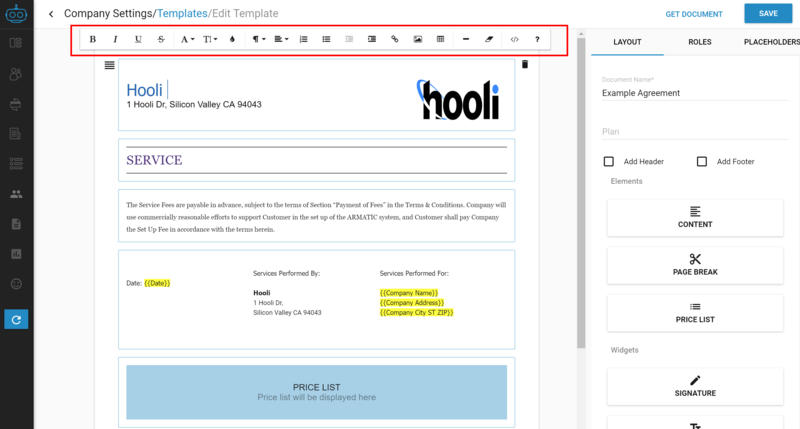 Placeholders are information that is unique to the recipient or document being sent (i.e. company name, date, address) and is filled out during the review stage of sending a document. 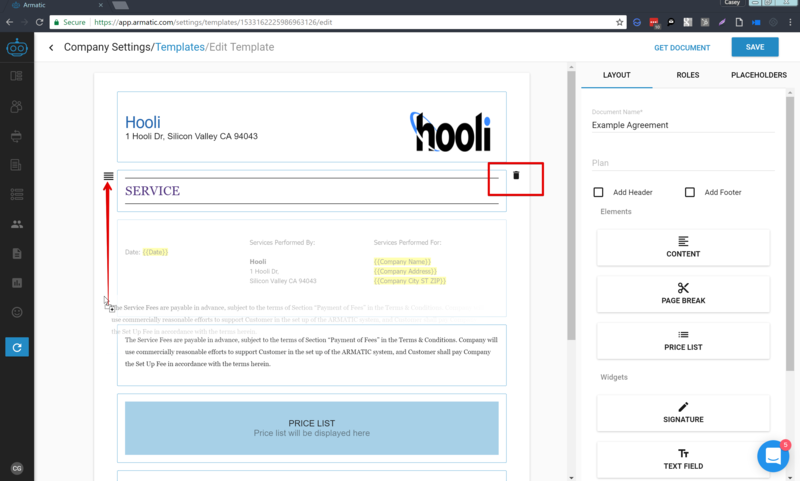 Simply click on the name of a placeholder to copy it, then paste it into a content element on the template. System placeholders are information that is pulled from the Armatic platform, information like company address, email, phone number, can be pulled from the customer record into the document. 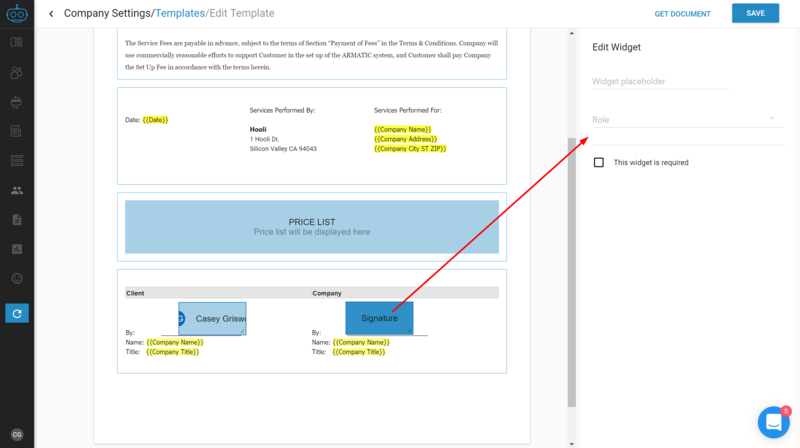 Custom placeholders can be used as a reminder to fill out information from outside the Armatic platform. 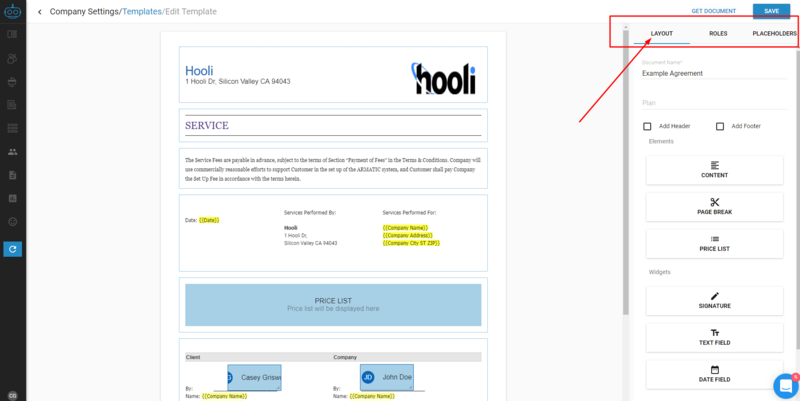 Information like "installation date", product descriptions, service terms can be entered into an agreement as a placeholder. Simply enter two "curly brackets" on either side of the content like this: or . Clicking into a "Content Element" enables the editor for that section. The editor is similar to a word editor, allowing you to change the common styling options as well as more advanced settings like add images, video, tables, even the raw HTML. 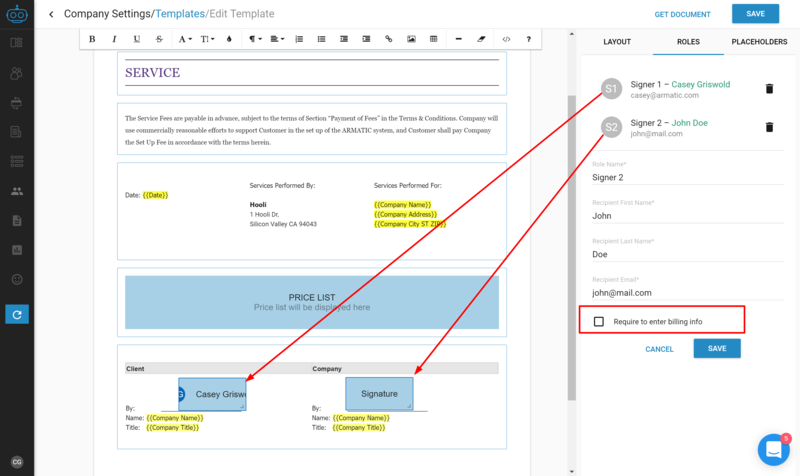 Create complex layouts and designs with "Tables". Use the table popup menu to control settings like, border viability, (toggling the "Table Style" setting), background color and cell alignment. Move and delete entire "Content Elements" using the "Move" or "Delete" icons on either side of the content element.